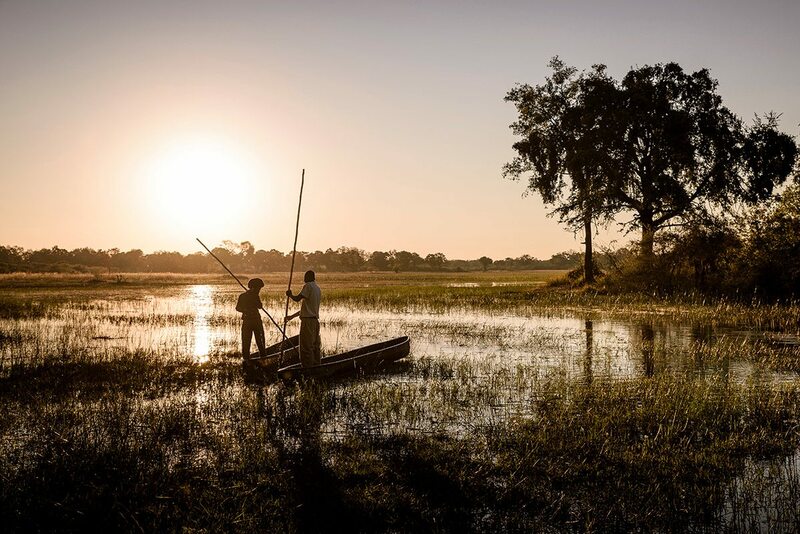 A mokoro safari in the Okavango Delta, Botswana, allows you to experience the life of this watery wonderland in a traditional craft. View mammals and birds from the waterline as an expert poler guides you through the bulrushes and marshes of this Garden of Eden. I had a feeling this was going to be the highlight of our trip to the Okavango Delta. 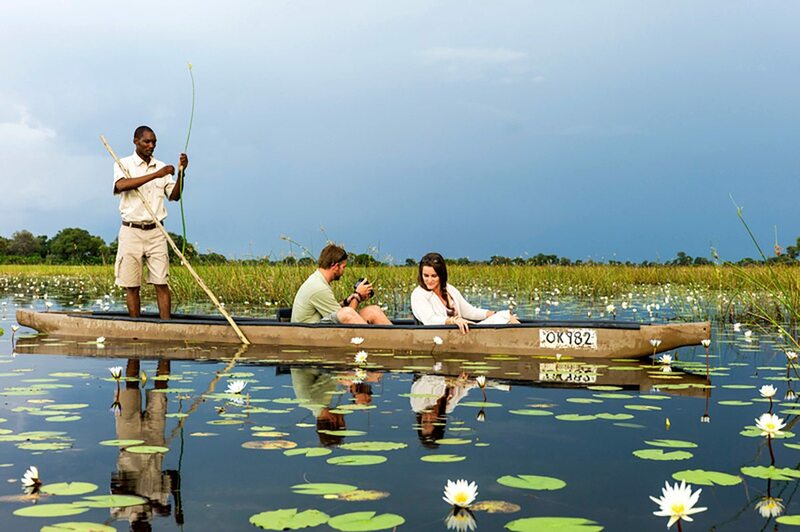 There can be no better way to experience this water wonderland than in a traditional mokoro. These ‘dug-out’ craft – about 6m in length – have become the iconic symbol of the delta. We gathered on the bank of an inlet where we met our mokoro poler, Kagiso. After a brief introduction, we clambered into the craft: my partner in front, me behind and Kagiso at the stern. He used a long pole, called an ngashi, to propel the mokoro. With a couple of powerful strokes we were off, gliding out of the bulrushes and into the main stream. 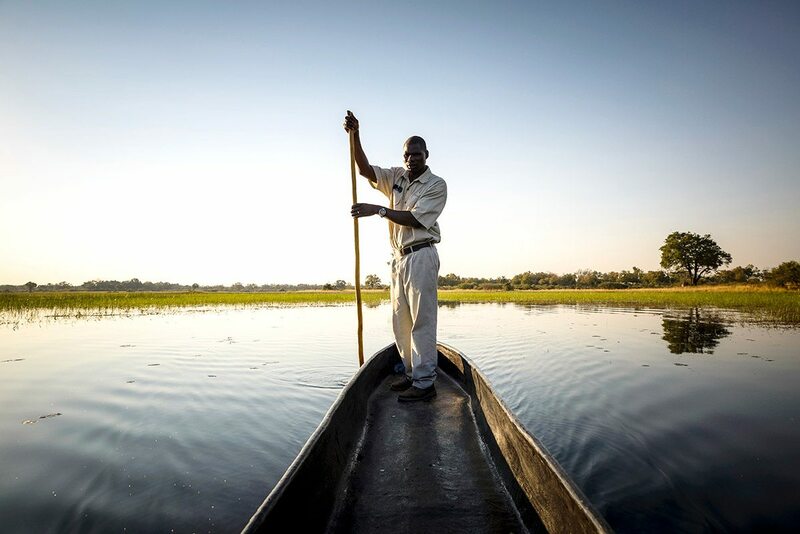 Kagiso was a muscular fellow with an intimate knowledge of the delta and its labyrinthine waterways. He was able to guide the craft with considerable speed and agility, having perfected his skills since boyhood. I’ve been punting in the genteel environments of Oxford and Cambridge before, but this was a different ballgame altogether. 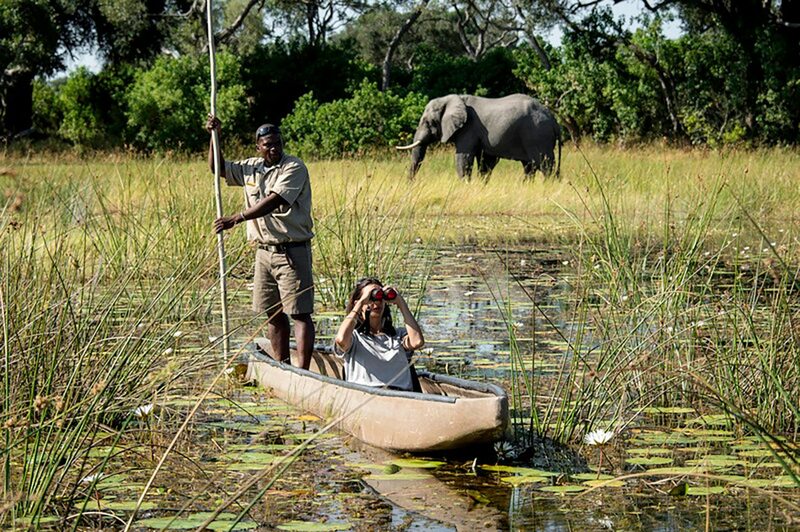 Punting in the African wilderness! Kagiso went on to explain how, because timber rots, more and more trees had to be cut down, a practice that was not environmentally sustainable. Although the delta is able to compensate for the amount of trees needed, the fact that only older trees were being used had a negative impact on the ecosystem. Thus the modern mokoro is usually constructed from moulded fibreglass. Durable, long-lasting and environmentally friendly, its shape still harks back to the days of wooden craft. ‘What wood do you use for the poles?’ I asked. Reeds pressed in around us as Kagiso eased us along. The pole slid gracefully through his hands. Then, with the slightest grunt at each stroke, he drove the mokoro through the water. A rippling arrow creased the afternoon’s reflections. 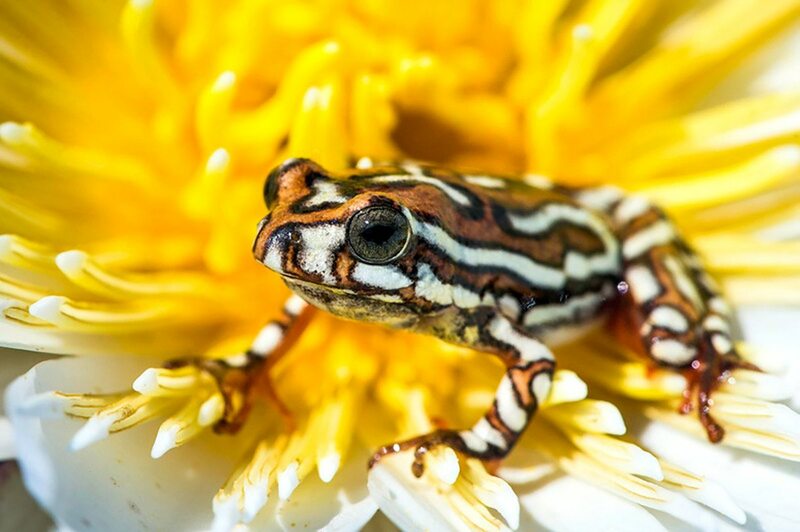 We were enveloped in a cocoon of peace, gliding through water that mirrored the sky, brushing past reeds that were home to brightly coloured frogs. We approached an elephant, ear deep in the water and happily munching reeds. He gave us a mighty shake of the head, then carried on eating. The birdlife was amazing. I had fortunately packed my long lens and photographing the birds from the waterline was a delight. We glided silently up to cranes, egrets, darters, geese and ducks. At one point, we came to a heronry packed with sacred ibises, marabou and yellow-billed storks. 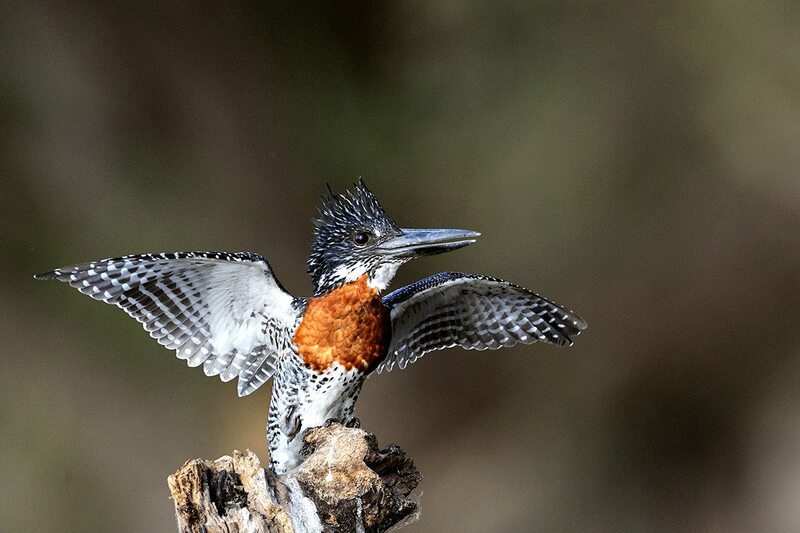 Many were perched on nests, feeding their little ones and kicking up a delightful racket. Others were industriously building new apartments in the treetops. Our mokoro skirted a pod of hippo. We drifted up against the bank a safe distance away and watched for a while before drinks were passed around. It was the perfect evening in the delta with the sounds of sunset serenading us. 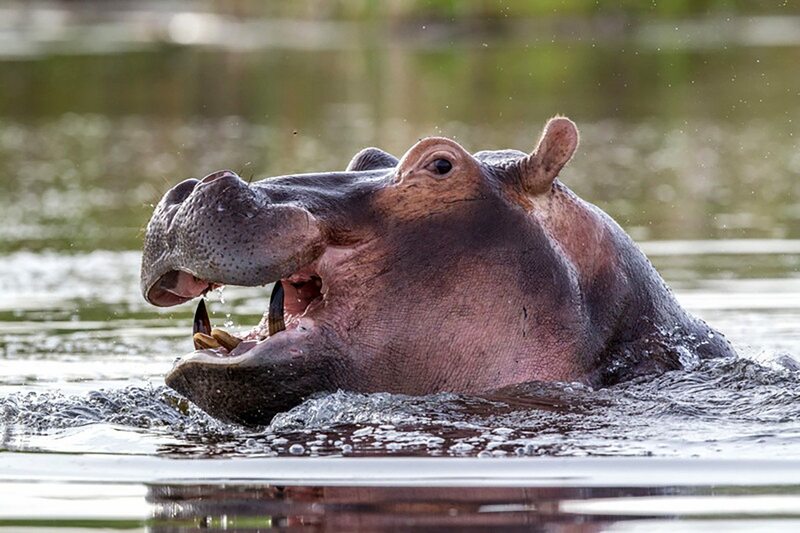 I was watching one of the hippo as it circled the boat. Suddenly, it dived under the water. A few moments later, it burst to the surface about 40m from us, honking loudly. Kagiso decided to move away, giving the grumpy fellow a wide berth and poling us back towards camp in the golden light. Just then, a fish eagle loosed its haunting cry, which echoed across the water to us. It sent a shiver down my spine: the iconic call of the African wilderness. 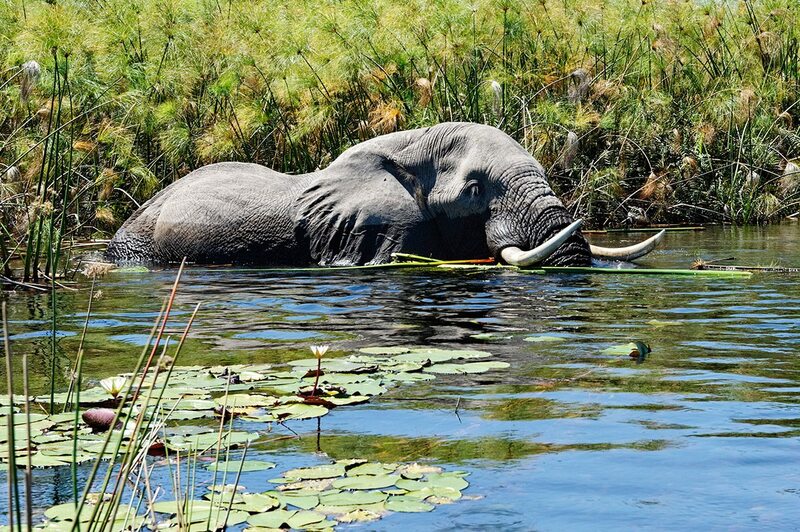 This elephant is enjoying a dip in the Okavango Delta. 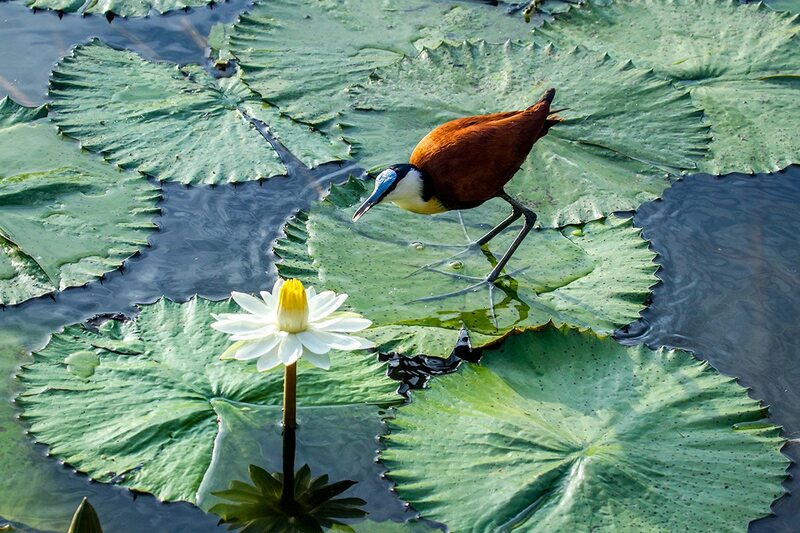 The African jacana is also known as the lily-trotter. Xugana Island Lodge provides ample evidence to support the view that solitude is the new luxury. This luxury Botswana safari lodge’s location in an exclusive private concession allows you all the privacy you need, while still giving you access to a enormously game-rich area. Camp Moremi, a luxury Botswana safari lodge, takes its name from the game reserve in which it’s situated, and ultimately from the visionary chief who first declared this a protected area. Staying here allows you to benefit from his far-sighted decision, just as the wildlife itself does. 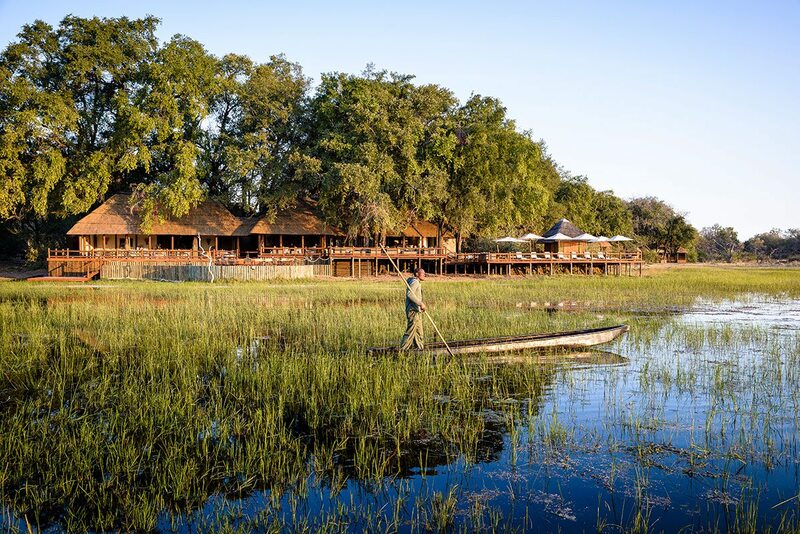 Camp Okavango is a luxury Botswana safari lodge with a difference. 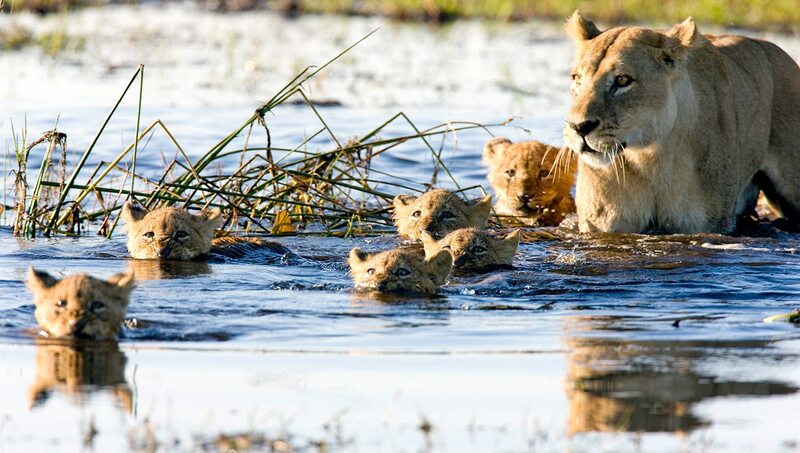 Rather than focusing on game drives, its setting on a small island means that the emphasis is on water activities. This leads to encounters with different animal and bird species, and a deeper understanding of this incredible wetland ecosystem. 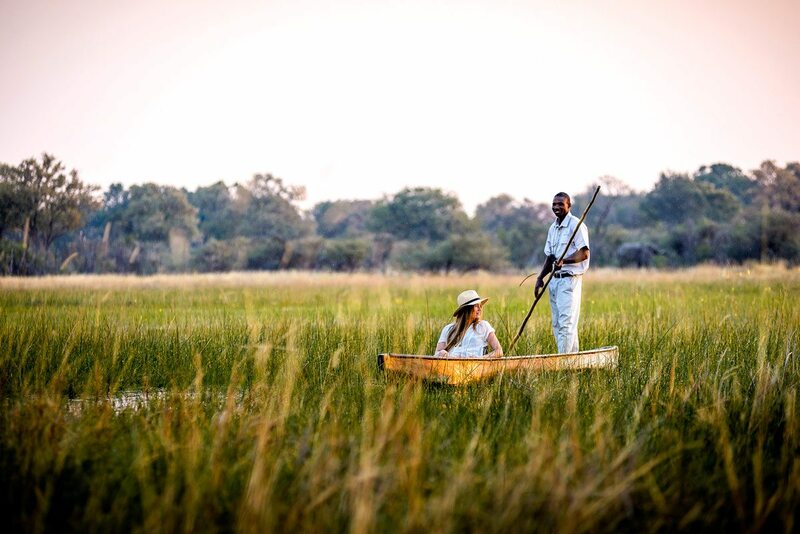 Botswana’s Okavango Delta needs no introduction, and the classic safari styling of Sable Alley is entirely in keeping with what you might expect from a luxury Botswana safari lodge. The light ecological footprint and emphasis on community partnership however speak to a more visionary approach to wildlife tourism. Trace the steps of Chief Moremi via game drives or mokoro excursions at his former hunting grounds of Moremi Game Reserve. From scenic flights to indulgent spa treatments and gourmet cuisine, at Sanctuary Chief’s Camp the royal treatment comes standard. Vumbura Plains is both ground-breaking and ecologically sensitive. Despite there being two satellite lodges on the same site, the overriding sense is of intimacy and personal service. It’s also one of the only places you can hot-air balloon over the Okavango Delta from – a magnificent experience!